LUSAKA, Zambia (CNS) — Zambians are living in fear as police brutality increases and the southern African country approaches dictatorship, Zambia’s Catholic bishops said. The bishops “are deeply saddened” by police officers’ “unprofessional and brutal conduct,” arbitrary arrests, “horrific torture of suspects,” and the “careless, inflammatory and divisive statements of our political leaders,” Archbishop Telesphore Mpundu of Lusaka, president of the bishops’ conference, said in an April 23 statement. “Anyone who criticizes the government for wrongdoing is sure to have the police unleashed on him or her,” the statement said. Zambia’s main opposition leader, Hakainde Hichilema, was arrested and charged with treason for failing to move off the road for President Edgar Lungu’s motorcade in early April. The charge allows no bail and can carry the death penalty. While the bishops “do not in any way condone illegality,” they “deplore the massive, disproportionate and entirely unnecessary force with which the police acted in apprehending” Hichilema, Archbishop Mpundu said. Hichilema was narrowly defeated by Lungu in an August 2016 election. He has unsuccessfully tried to challenge in court what he claims were fraudulent election results. Zambia’s judiciary has “let the country down by failing to stand up to political manipulation and corruption,” the bishops’ statement said. “Our democratic credentials … have all but vanished in this nation that loudly claims to be God-fearing, peace-loving and Christian,” it said. 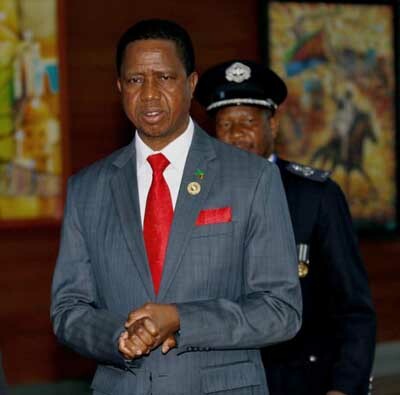 “As a result of brutalizing the people through the police,” Zambians are “reduced to fear so that the order of the day is corruption and misuse of public funds,” the statement said. “There is fear and trembling among the people, shown in the way they are afraid to speak out against injustices,” it said. The bishops called for an immediate halt to intimidating statements by ruling party leaders and said “the continuous tension” between the ruling party and opposition affects the lives of the public. Zambia “is now, all except in designation, a dictatorship and if it is not yet, then we are not far from it,” they said. “We therefore demand” that the government “puts in place concrete measures to reverse this worrying and dangerous trend,” the bishops said. Noting that “it is sad to see the police being used and acting like political party cadres,” they called on the government to depoliticize the police service. The independent body with a membership of more than 1,000 legal practitioners, which faces a government-led move to disband it, should “play its rightful role as one of the most effective checks and balances in a true democratic dispensation,” they said. Noting that church-led mediation efforts in early 2016 failed after agreed-on resolutions “were broken, particularly by the ruling party,” the bishops said that the country’s church leaders would be prepared to try again if asked to do so by the government. “The politicians, especially those in the ruling party, must realize that the nation … is deeply divided,” the bishops’ statement said.